Wedged in between Vietnam, Laos and Thailand in South East Asia, The Kingdom of Cambodia is home to over 14,000,000 people. Devastation caused by the effects of the Vietnam War, the brutal regime of the Khmer Rouge and years of civil conflict have contributed to making Cambodia one of the world's poorest countries. However, a more stable political environment and a recent increase in tourism is allowing the country to rebuild and slowly leave behind its troubled past. 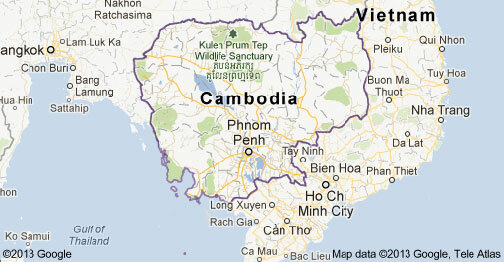 Due to its close proximity to Vietnam, Cambodia became caught up in the Vietnam War and was covertly bombed for years by the U.S. military. Claiming Viet Cong guerillas were maintaining a supply line through Cambodia to support their comrades fighting in South Vietnam, the U.S. conducted constant bombing raids, killing or maiming thousands of innocent Cambodian civilians. These bombing campaigns resulted in Cambodia becoming the most densely mined country in the world—most of them unexploded cluster bombs dropped by U.S. forces. The estimated 10 million anti-personnel mines in the country are responsible for over 19,000 deaths and 50,000 amputees since 1979. Even with coordinated efforts to clear the mines, there continues to be a further one thousand mine victims every year, many of them farmers clearing land for crops or children playing in fields. Led by the French educated, Pol Pot, the Khmer Rouge regime defined the darkest period in Cambodia's history. Taking advantage of the civil unrest when King Sihanouk was deposed after the Vietnam War, the guerrilla group captured the country's capital, Phnom Penh, and began to act upon their deranged plans to create a socialist utopia by transforming the country into a farming collective. The entire population of the capital city and other provinces was forced at gunpoint to leave everything behind and move to the countryside to begin new lives as peasants. Pol Pot also ordered the extermination of intellectuals, teachers, writers, educated people and their families. The savage regime lasted for four years before being pushed out by invading Vietnamese forces in 1978. Between two and three million Cambodians— nearly a quarter of the country's population—were exterminated in the genocide, many of them buried in the infamous Killing Fields. Maintaining control over only the northern regions of the country, the Khmer Rouge waged war with the occupying Vietnamese government creating years of civil violence and unrest that lasted until 1998 with the death of Pol Pot. Vietnam eventually returned independence to Cambodia and with it, the opportunity to rebuild. Today, employment in Cambodia is centred around tourism, agriculture, construction and the garment industry. The agriculture sector represents 30 percent of Cambodia's GDP and it is one of the country’s most important sectors since most of the poorest inhabitants derive their income from farming. However, Cambodia’s agricultural sector remains extremely volatile as rice paddy production is tied to weather conditions. Monsoon season, from May to October, brings heavy rain, humidity and strong winds, resulting in flooding throughout many regions. The majestic ruins of Angkor Wat. The service sector, which includes trade, tourism and transport and communication, represents the biggest share of Cambodia’s economy with 39 percent of GDP. Since 2004, the tourism sector has increased by 18 percent annually due to the number of foreign tourist arrivals. The main attraction is Angkor Wat and the surrounding Angkor ruins located in the province of Siem Reap, which are a collection of over one hundred temples dating back to the ninth century and once the seat of power for the Khmer Empire. One of the largest challenges facing Cambodia is that the older population often lacks education, particularly in the countryside, which suffers from a lack of basic infrastructure. In 2004, it was estimated that only 74% of the population was literate. Child labour is also a problem, as children are often expected to forgo school and work in dangerous circumstances in factories or brick kilns, foreclosing the option of a school education for most of them. Many young girls from the countryside are forced into prostitution in the city with the intention of sending money to their families back home. Alann represents a growing movement of young Cambodians who seek change for their country and view education as the vehicle to correct injustices and improve the lives of all Cambodians.